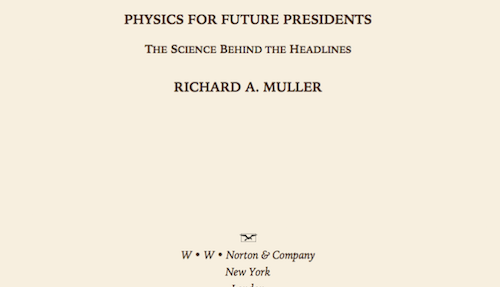 Physics for Future Presidents is a very interesting and entertaining book published in 2008 by Richard Muller. Muller wrote the book in the form of an educational primer addressed directly to a future president. Muller opens with a quote often attributed to Mark Twain: “The trouble with most folks isn’t their ignorance. It’s knowin’ so many things that ain’t so.” Interestingly, to illustrate the aphorism itself, Muller points out that this famous quote is even from Twain. the quote is correctly attributed to Josh Billings, a humorist from the nineteenth century. Muller covers a broad range of important physics concepts and principles which are valuable for rendering technically valid presidential decisions. He covers nuclear energy, nuclear weapons, fossil fuels, renewable fuels and solar energy, nuclear radiation and biological weapons, nuclear waste, space and satellites, human and robotic space exploration, global warming. Muller also spends considerable time reviewing the scientific methodology for establishing and validating scientific facts and principals and differentiating these from opinions and various forms of conjecture. He provides tools and insights to help the future president to identify various forms of propaganda such as distortions, exaggerations, cherry picked data, news bias, and misuse of statistics. Muller carefully explains and debunks many myths and misconceptions, including concerns over radiation and the actual prevalence of various forms and concentrations of radiation to which humans are constantly exposed. He closes the book with a summary of exciting new technologies including biofuels, clean coal, concentrated solar energy, safe nuclear technology, and various forms of renewable energy. I thoroughly enjoyed this book, and am pleased to recommend it to anyone who has a general interest in science and scientific principles and methodology. You don’t need to be either a physicist or a presidential aspirant to enjoy and appreciate this book. This book will provide you with additional tools for your leadership and decision-making toolbox.